Earn to die fans must be wondering why one wheel upgrade is missing from the original game earn to die. 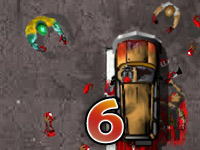 It was stated in the first game that the super wheel was lost during the zombie apocalypse. 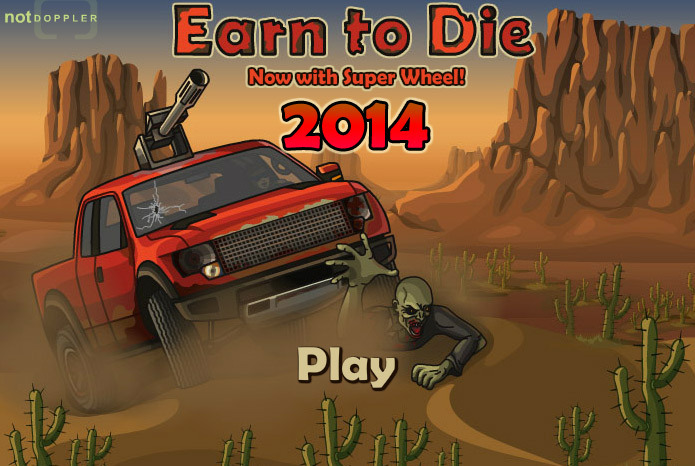 In this version of the game everything is same as Earn to Die except that the super wheel had been found. The main character is stuck in a zombie apocalypse and he found a way to escape, a helicopter more than 3000ft from his garage. 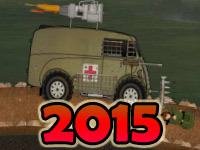 Your goal is to reach the helicopter by driving cars without running out of fuel or being stuck. Three cars are available to be bought by cash. Each car can be upgraded for you to go further. The cheaper the car and its upgrades, the weaker it is. Even you fully upgrade your starting car it will only take you to point. 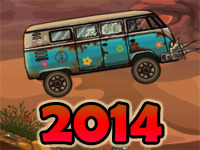 The game is designed so that it will be completed by fully upgrading the most expensive car available. This is only possible by earning cash. Small Hatchback – this is your starting car. It costs $500.00. Fully upgrading this vehicle would only take you to 1000 ft at the most. Good Old Pick Up – This car when not upgraded is stronger than a fully upgraded Small Hatchback. It costs $25000. 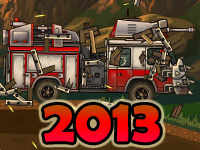 Cool Heavy Truck – The strongest car. Being the most expensive at $200,000, this car is the key to completing the game. It has a super wheel upgrade in this version. NOTE: Fully upgrading cars aside from the Cool Heavy Truck is not essential, as soon as you have the money to buy the strongest car do so and neglect fully upgrading the Small Hatchback and the Pick-up. However upgrading cheaper cars is also essential to go further each run. 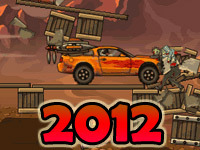 Also, please note that this game includes the super wheel but not the new cars from Earn to Die 2, the newest version. Fuel – It keeps your car going, the moment you run out of it your vehicle stops. Wheel – Upgraded wheels helps you run through rugged and rocky terrain easier. It also helps in climbing slopes. Engine and Transmission – This is the core of any vehicle, upgrading this gives you more speed and helps you in conserving fuel. 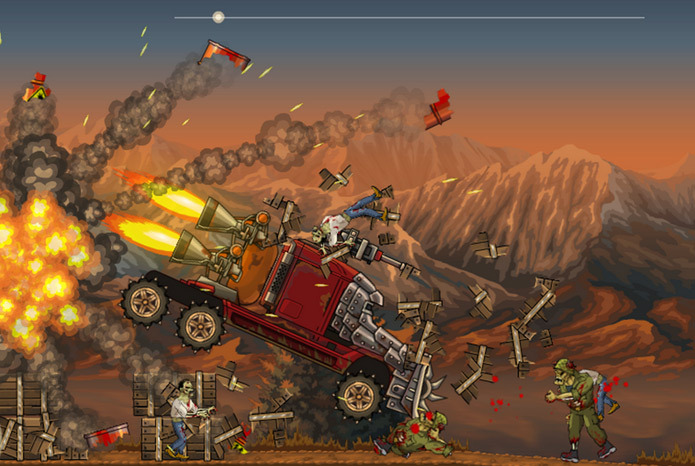 Weapon – The weapon available in this version of earn to die is a mounted gun. However installing this is not really necessary. 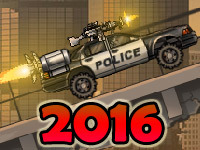 This gun fires automatically at zombies at site and stops firing when it runs out of ammo. 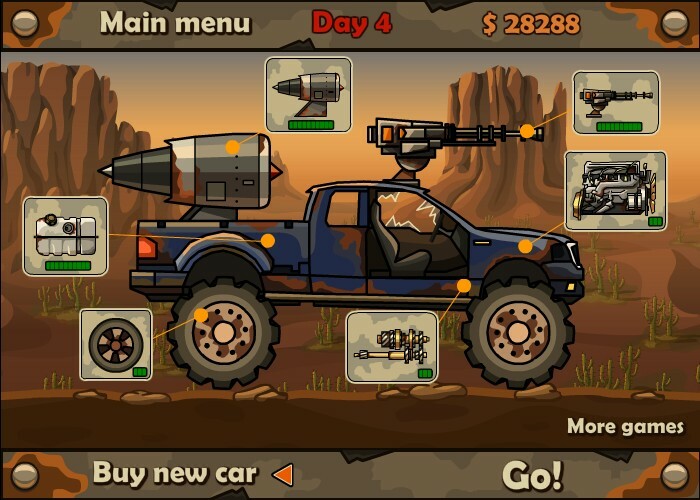 Ammo for guns even if it is upgraded is not enough to kill all zombies in the game its better to upgrade your guns after upgrading all other parts of your car. NOTE: When you buy new cars upgrades rom your old car will not be carried to your new car. Each upgrade is compatible to a certain car only. The game has only one level. A 3130ft terrain containing zombies, slopes, pile of boxes, rocks, and cliffs that will stop you from getting to the helicopter. The further you go, the more difficult the obstacles you will encounter. Earning money is your primary goal in the game. You cannot reach the goal without fully upgrading the most expensive car, and to do that you need the money to buy cars and upgrade them. You earn money by driving from your the starting point to as far as you can. Further distance means more money. Stunts also gives you money. Upgraded and more expensive cars can go further and do more stunts, so its good to upgrade your car little by little until you have the money to buy the ultimate vehicle. Aside from the discovery of the Super Wheel, the game is now harder. With the super wheel found the game adjusted so that it could only be finished with all the upgrades maxed out including the Super Wheel which is not available in the previous version.